Separate area, flat screen, cable. Separate home cinema with projector. For those of you looking for a contemporary designed house of the highest standard then Diamantina is it. Quite simply it is one of the best modern houses available in Quinta do Lago with stunning furnishings and state-of-the-art equipment, including smart home system, zoned music system, wifi internet, cable TV, home cinema and heated indoor and outdoor pools. Located in the Monte Golfe area in the heart of Quinta do Lago, front line to the golf course. Accommodation is on three levels, all accessed by either the staircase or lift. It is air conditioned throughout, and managed by high-tech home automation system. There are eight bedrooms, three double rooms and five twin rooms, each with en suite bathrooms. Access from the road is through the electric sliding gate to Calcada Drive. The ground floor is largely open plan with a very large and double height hallway, glass wall and ceiling to give the feeling of space and with the rooms arranged off it. The kitchen is large and fully equipped with halogen hob, two ovens, two built in fridge freezers, white cabinets, and a large indoor dining table for up to 14 guests. In the living room area there is comfortable seating, occasional tables with a separate TV area giving access to cable TV and DVD player. 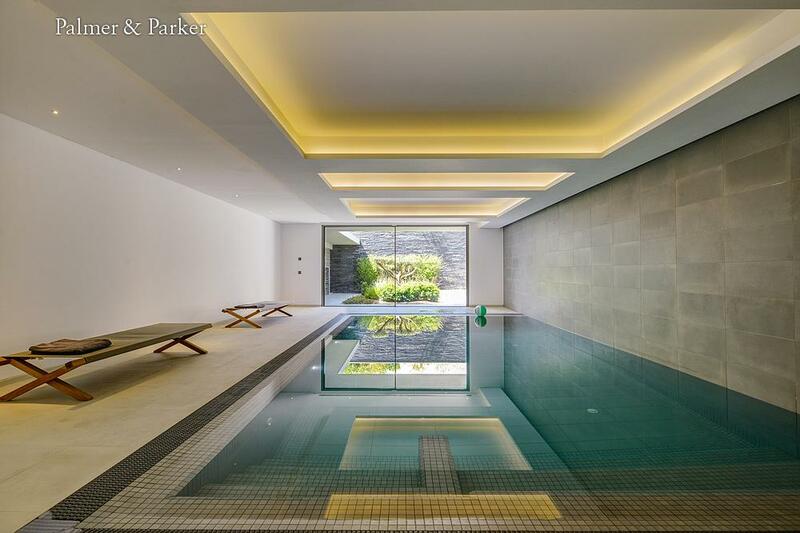 Sliding doors lead to the pool terrace and garden. The pool is 10m x 5m approx with Jacuzzi on a raised level and a slide into the main pool Enjoying lovely views of the golf course but good privacy, the garden has lawns and mature trees and shrubs. The barbecue area has a large dining table and chairs and built-in gas barbecue. a double room with queen size bed and shower room en suite. The master suite consists of two separate bedrooms arranged around the dressing area with large en suite bathroom, with bath and shower. A twin room with windows on two sides, and en suite containing a walk-in shower. Downstairs from the entrance level is the indoor heated pool approximately 8m x 4m, with jacuzzi jets and seating area at one end, home cinema room with large screen and cinema seating for 7 people, table tennis and fully equiped gym. Two further twin bedrooms are on this level, each with its own shower room.